I cherish the relationship my mom and I have. I can talk to her about anything and she’s always there when I need a helping hand or listening ear. Honestly, I don’t know what I’d do without her. I need to tell her more often how much I appreciate her. Mother’s Day is right around the corner. Have you thought of how you’d like to celebrate mom? I have a few ideas for you! 1. Mother’s Day brunch. You knew I was going to say it, didn’t you? Mother’s Day brunches are the most traditional way to celebrate. Treat mom to a delicious brunch at her favourite restaurant. Just make sure to book in advance because many people probably have the same idea. Alternatively, you could show off your skills in the kitchen and whip up a yummy meal that mom will love. 2. Flowers and card. Pick up a bouquet of flowers and a nice card. Write out a thoughtful, heartfelt message on the card sharing what mom means to you. She will love it! 3. Video Connect with Mom. If you don’t live near mom, try going on video connect with her instead of a call. You’ll be able to see each other and it will be almost like she’s right there in the room with you. 4. Treat mom to a spa day. Everyone loves a spa day! Buy mom a gift certificate to a local spa for a day of pampering and relaxation. 5. Make a memory jar. The kids can help with this task, too. Write different memories of mom slips of paper, fold it up and put it in a jar for mom to read and enjoy. 6. Afternoon tea. Take mom out to a local tea room for some tea and sweets. We have a local tea room located in a historical mansion in our city that I know my mom is really want to go to someday! 7. Homemade beauty products. Instead of buying mom a beautiful sugar scrub, make your own. It’s easy to do. Just add sugar, coconut oil and essential oil to a pretty jar and mix together. Add some ribbon to decorate and voilá! 8. Buy mom tickets to a concert. My mom loves to rock on and would love to see her favourite oldie band in concert. We are a couple hours from a hotel that regularly has concerts featuring bands from yesteryear and mom has been wanting to go for some time. 9. Buy mom new phone accessories. 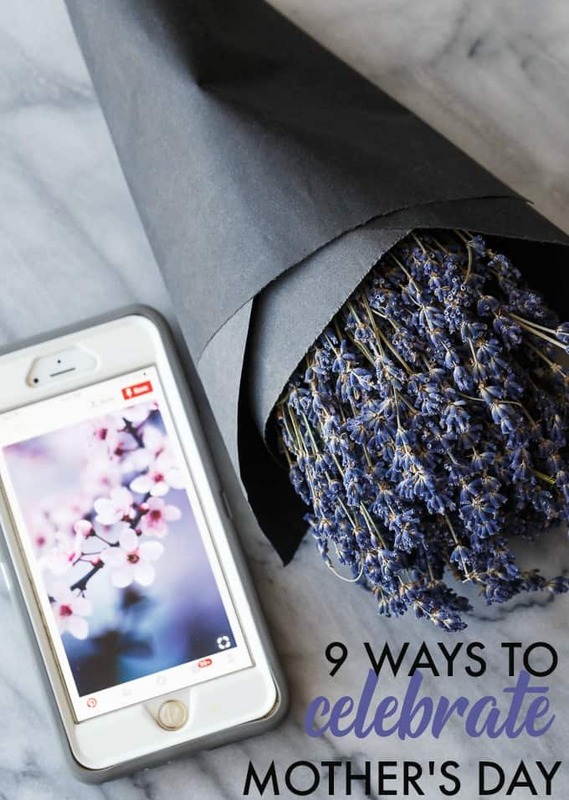 When you are shopping for mom’s flowers at the grocery store, make sure you also stop in to The Mobile Shop to pick mom up some gear for her smartphone. My mom is digitally connected and loves her smartphone. She uses it to shop online, socialize, bank, take photos and more. I know it would be a gift she would actually use. I like The Mobile Shop because of their fantastic selection of phones and plans, plus the convenience of one-stop-shopping. It’s easy for me to go in while I’m out grocery shopping at No Frills because I don’t have to make a special trip out. Their advisors can help you find the perfect gift for mom. What are some of the ways you celebrate Mother’s Day? These are great ideas. I’d love a spa day for Mother’s Day. That would be so relaxing and rejuvenating. I usually do the flowers and card thing. Mom lives in another state, so that is the easier to accomplish! Great suggestions! All the women who are mom’s in my family meet the Saturday before Mother’s Day and enjoy a nice meal at a restaurant. No kids, no cleaning up. It’s really nice! My sister is really treating my mom because she is giving her a trip to FL! It wont even compare to my card and small gift! I love these ideas! Afternoon tea?! What a unique, classic and fun idea for Mother’s Day! I love it! We are all about the brunch in our family. These are really fun and creative ideas for Mother’s Day but I’m thinking the Afternoon Tea could be a cool addition to the day. My gift is to get to go to an upscale Brazilian restaurant we don’t get to go often! Looking forward to it! These are some great suggestions! For Mother’s Day I would love if my kids made me a memory jar…well, after they let me sleep in and take me to brunch. LOL. These are all fantastic ways to celebrate Mother’s Day. It’s always nice to be pampered on this special day.